There are so many amazing things happening in my life right now. I sat down to try and write on Saturday and kept trying to write about 2 or 3 things all at one time. I am pretty good at multitasking, but that was way too much for me. So I need to focus on one at a time and make it one post at a time. You could not believe how stressful and painful this week has been. There have also been many AMAZING moments of spiritual growth for me this week also – but that is another blog post. I am a stress/ emotional eater. When it gets really bad (or really good) I want to eat sweets – cookies, candy, rice crispy treats and ice cream are my drugs of choice. I use that word drug because I am trying to medicate my feelings, which does not work. 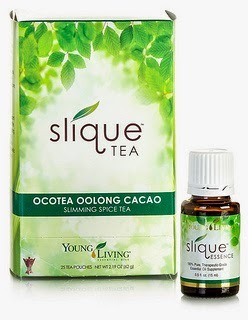 On Sunday last week I started using Slique Tea and Slique Essence. Sunday was really hard. I felt like I was hungry all day. I just kept drinking the Tea and Essence. I know it was mostly mental, knowing I was going to trying something different. I still wanted sugar and it was being offered at every turn. I had to just say no and keep going. It was also Easter Sunday, which did not make it any easier (sugar wise). That night I had trouble going to sleep. I figured it was due to drinking the Slique Tea later in the evening – it does have naturally occurring caffeine. In hind sight – I think it was a detox reaction and a releasing of emotions happening. Monday, was much better. By the end of the day, sugar cravings were almost gone. But Monday night was hard. I had trouble sleeping and I felt horrible. I was tired from not sleeping well the night before and I had to administer a state test the next day. I needed sleep. I experienced a lot of emotions that night – anxiousness, frustration, sadness, helplessness, hurt and probably more. But those are the ones that stick out. I spent time in prayer and stillness with God. I finally slept about 2 hours. On Tuesday, I was exhausted and I had a day of administering a state assessment. State testing is also exhausting. I kept drinking Slique Essence and Slique Tea. I was physically and emotionally tired but I was also feeling better. I know that sounds strange, but I felt like the worst of the detox was over. Cravings and thoughts of food were gone. Then some crazy spiritual warfare began (more about that in a later post). This would be a time I would eat sugar, eat sugar, eat sugar, eat sugar. You get the picture. I didn’t and it did not even cross my mind to do it. That night I also went to a beyond the basics class on cleansing. It was fabulous and so many people lifted my spirits that did not even know what was happening inside of me. Wednesday through today went about the same. The spiritual warfare was still going on, I continued to eat the way I am supposed to, drink my Slique Tea and Slique Essence. I still did not have sugar cravings. I set some goals last week and met all of them but one. I set the goal of walking 1 mile three times this week. I walked 2 times this past week and I am ok with that. I am doing this for weight loss. Many other benefits came this week, but I still did it for weight loss. I am so excited. I don’t expect weight losses like that every week. I fully believe that weight loss needs to be slow and steady so that your body can adjust physically and so that you can learn the things you need to so that you will have a healthy weight forever. I will continue my goals from last week. I am going to try hard to walk 3 times this week. It is a wonderful stress release and from the sounds of it, I may need it next week. More next Saturday on this next week's results! I'm going to agree with what you said about sugar. The things you mentioned like candies and cookies, too much of these can be as damaging as drugs. Glad to see that you're much stronger now.